Aquatherm Blue Pipe® was an ideal solution thanks to its corrosion resistance and its light weight compared to steel. Aquatherm pipe provided labor savings thanks to heat fusion and its lighter weight compared to steel. For some direct-buried sections of the project Aquatherm pipe didn’t require insulation, where steel pipe would have. Ownership liked the cleaner nature of PP-R and the reduced risk of theft that Aquatherm pipe offer. 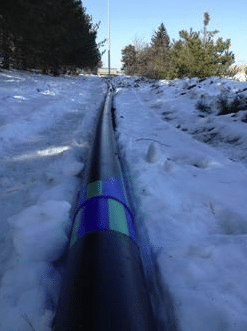 With several thousand feet of mostly direct-buried pipe needed, the engineering team sought a pipe system that would hold up to the corrosive condensate.